Amid the torrent of rumors surrounding the transfer market, a quiet announcement was made on Wednesday. 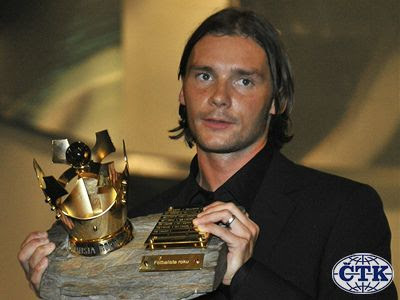 After 6 years with AC Milan, Marek Jankulovski was not only leaving Milan, but was also retiring from football. The 34 year-old Czechoslovakian left back meekly left the game he loved following yet another injury combined with his contract expiring this month. Janks came to Milan in 2005, where he had a less than stellar first year. Having come to Serie A in 2000 by way of Napoli and then played 3 years at Udinese, Milan was the big time for him. Some players like him often never make it at this level. However, in his second year, he more than made up for his prior poor form. He made 50 appearances for the club, scored 3 goals, and played in that Champions League final against Liverpool. He topped the year off with a great goal in the UEFA Super Cup that saw Milan victorious over Sevilla. From the unremarkable to the very remarkable, what a turn around season. This stellar form did not go unnoticed, as he won the 2007 Czech Footballer of the Year ahead of 2nd place Petr Cech. It should also be noted that he played for nearly 10 years for his National Team, achieving 77 caps and 11 goals during that time. We didn’t ever hear much about Jankulovsi, or much from him, either. But in January of the 2009-2010 season, Inter were looking to trade Mancini for Jankulovski. Janks refused the transfer, causing quite a stir. It was well know that Leonardo wanted Mancini, but Janks had to be part of the deal. He said, "Truth be told, I didn’t give it much thought… I wanted to stay at Milan, I’ve been here for five years and I’m settled." Truth be told, Janks, you saved us so much grief by taking that stand. God bless you. May we never forget your blessed stance. In addition to his solid tackling, pace, and the occasional goals, one of his other notable contributions was simply maintaining a spot on the first team. He wasn’t always the star, he just worked really hard and played really well. And by playing well enough, that meant keeping others off the pitch who didn’t play well enough. (I’m looking at you, Bonera & Antonini!!) He only had 7 total appearances in all competitions this year for Milan, mostly due to injury woes, but they were 7 appearances where we didn’t have to worry about the left side, we knew we could count on Janks to have it covered. Jankulovski’s struggles with injuries toward the end of his career were punctuated by one final blow. During the March 19th game with Palermo, he was injured in the 13th minute and left the game. This was devastating on so many levels. For one, he was replaced by Antonini. Secondly, we lost the game 1-0. I’m not saying it was necessarily because of losing him that we lost, I’m just saying we lost more than just a player that day. But most importantly, the injury would require surgery 3 weeks later, with a 6 month recovery period. The injury that broke the camel’s back, along with his contract expiring and thoughts he had already expressed about retiring and going back home all contributed to the announcement he made on Wednesday. Due to his surgery, he was the only player who was unable to make the trip to Rome, where the champagne started flowing and everyone else was able to celebrate Milan’s 18th Scudetto win. He deserved to be there, too. But at least he will take home a medal, having helped win the league as the crowning achievement to a very respectable career. This post was inspired by The Smiths “Hatful of Hollow” album.